Provision of sufficient medical protection and health care services for Tatmadaw members and families is the goal and the duty of the medical corps. 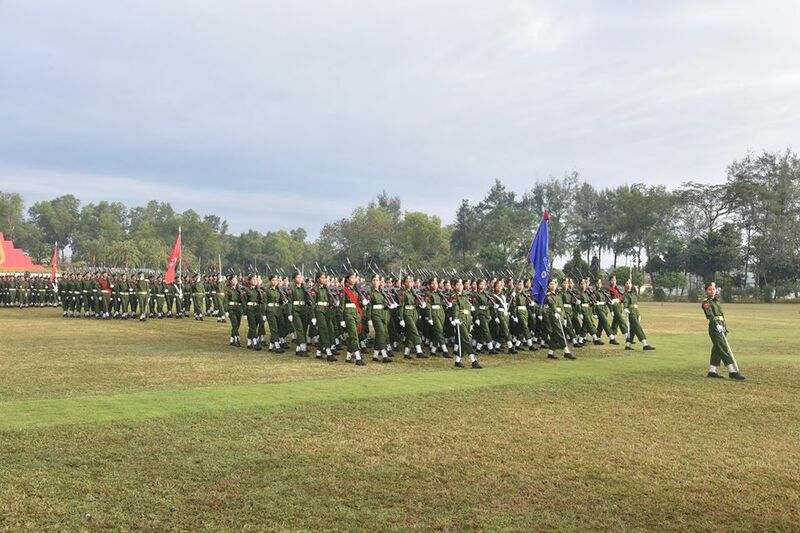 In accordance with its motto — skilful and helpful medics — the Defence Services Institute of Nursing and Paramedical Sciences (DSINPS) is producing military nurses and paramedics yearly, said Commander-in-Chief of Defence Services Senior General Maha Thray Sithu Min Aung Hlaing at the Passing out Parade of 15th Intake of DSINPS and 2nd Intake of Lady Nursing Sciences held at the parade-ground of Defence Services Medical Academy in Yangon this morning. Also present on the occasion were Commander-in-Chief (Navy) Admiral Zeya Kyawhtin Tin Aung San and wife, Commander-in-Chief (Air) General Zeya Kyawhtin Khin Aung Myint and wife, senior military officers of the Office of the Commander-in-Chief (Army) and their wives, the commander of Yangon Command, acting Commandant of the DSI-NPS, senior officers of Yangon Station, invited guests, parents and relatives of the trainees. 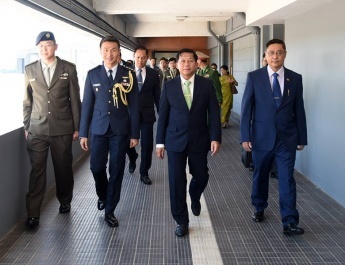 First, Commander-in-Chief of Defence Services Senior General Maha Thray Sithu Min Aung Hlaing took the salute of the graduate trainee companies and inspected them. Next, trainee companies saluted the Senior General in slow march-past and quick march-past. Afterwards, the Senior General presented Best Trainee Award to Trainee No. 3815 Trainee Wai Phyo Hein, Excellent Award in Training to Trainee No. 3822 Trainee Thant Sin and Excellent Award in Studies to Trainee No. 3780 Soe Khant Aung of the 15th Intake of DSINPS. Next, the Senior General presented Best Trainee Award to Trainee No. 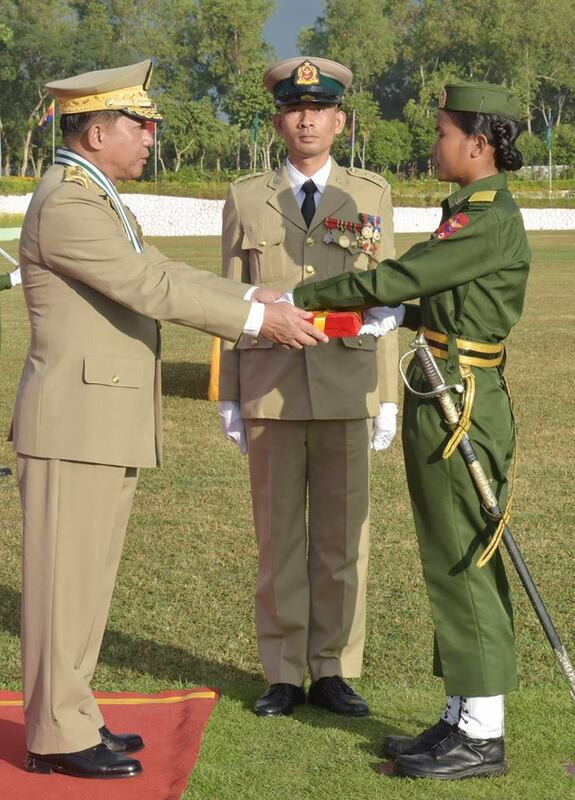 135 Trainee Nan Ya Wai Paing, Excellent Award in Training to Trainee No. 119 Trainee Su Mon Naing and Excellent Award in Studies to Trainee No. 164 Trainee Aye Thawda Min of the 2nd Intake of Lady Nursing Sciences. In his address, the Senior General said the trainees were being taught five basic principles of nursing spirit — devotion, goodwill, kindness, sacrificing and modality — so that they would be imbued with qualifications of a good nurse. They have already undergone theoretical and practical training to be a good nurse. So, they should provide a wide array of health services ranging from diagnoses, disease prevention and control and health promotion to rehabilitation and medicine production apart from healthcare for the families and the public at the places they are assigned to. it is essential for every solider to have five basic abilities—“spirit, discipline, allegiance, unity and three capabilities”. A strong Tatmadaw is also an essential need for building a standard army. Building up the Tatmadaw requires quality as well as quantity. In acquiring quantity, it is necessary to prevent unnecessarily decreasing strength resulting from being unhealthy. Meanwhile, every Tatmadawman must try to stay healthy to improve their quality. Those who completed the above training courses are to work hard on providing healthcare by applying the paramedical subjects they have been taught so that Tatmadawmen can be fit and healthy. Every individual needs to improve their ability by constantly learning modern treatments and branches of medical studies. To do so, necessary teaching aid and infrastructures are being provided. Modern patient simulators, practical rooms for nurses and other quality assurance facilities have been provided. Moreover, plans are underway to set up common laboratories. As the libraries are being upgraded for learning health-related subjects, paramedical staff have to continue to study higher level pharmaceutical and paramedical subjects by making combined use of such facilities and the experience they have gained from practical field. While studying modern medical subjects, they must not neglect the strong potency of traditional Myanmar medicine. The ancestors were able to make effective use of precious traditional herbs grown on Myanmar’s soil. Since the subject of traditional medicine they have been taught is based on making medicines from naturally-grown herbs, systematic study of medicinal plants based on herbalism will contribute a lot to the healthcare sector. There are already historical records that healthcare services were provided in ancient Myanmar Tatmadaw with the use of traditional medicine. Thus, they are required to be well-versed in both Western medicine and traditional medicine in order that they become skilled and proficient paramedical staff. In this context, meeting set standards is also important, said the Senior General. 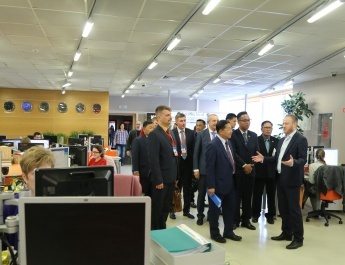 It can be seen that units of medical services dutifully carried out health care services for the families of Tatmadawmen and the people as well as discharged State defence duty in its traditions. In so doing, Tatmadaw mobile medical teams from medical services are assigned to hilly regions, plains, seas, coastal regions and border areas to conscientiously give tasks of health care services to the people regardless of races and religions with goodwill. It is important for ensuring health and fitness of everybody. As such, all the people in the region will have to work for regional development. The mobile health care teams of the Tatmadaw are implementing such aims. It is of great invaluable for the State that strength of the most of the people having health and fitness can contribute towards all sectors including economic, social and education sectors. Only when number of healthy and workable people increases, will the regions develop. Hence, mobile health care services directly serve the interest of the people as well as contribute much to regional development on one hand. 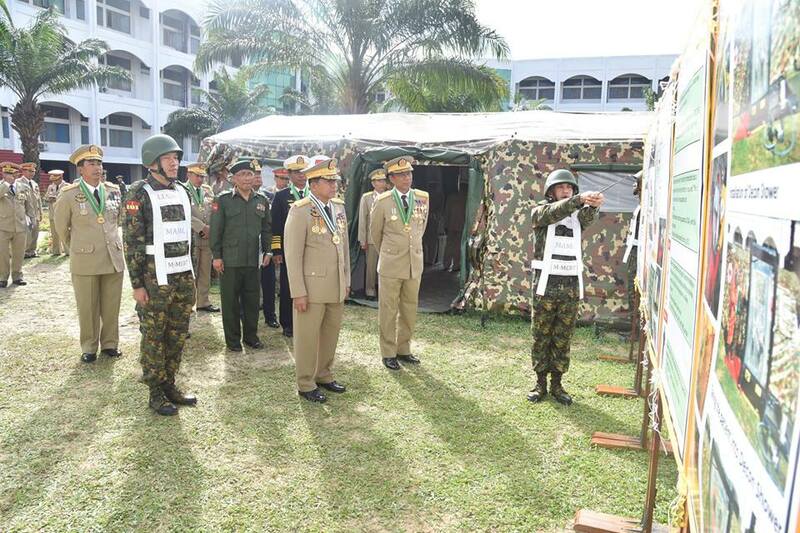 As such, the Tatmadaw is successfully carrying out a defence duty as safeguarding the interest of the people by providing mobile health care services across the nation. 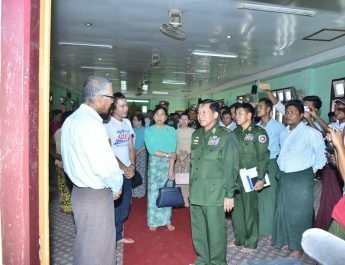 As it is the most effective organizational task, the Senior General urged them to try hard to have effective and successful health care services for the people in their assigned areas by applying their experiences in medical subjects. Then, the Senior General noted that as the Tatmadaw which was born together with independence struggles based on its experiences and concept cannot accept encroachment on Our Three Main National Causes, the Tatmadaw is safeguarding the State by upholding the Our Three Main National Causes as a national duty. The motto “the Tatmadaw never betrays the national cause” is a clear truth of the Tatmadaw for the State and citizens. The national cause to which the Tatmadaw never betrays is Our Three Main National Causes which are required for the State and the national people forever in any era and any system. 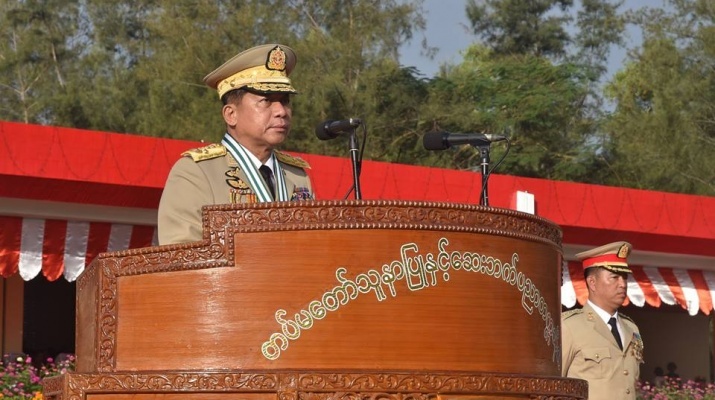 In safeguarding Our Three Main National Causes, the Tatmadaw has adopted six peace principles for restoring eternal peace which is actually essential for peace and stability, unity and development of the nation based on its history and gives a helping hand to the government in peace making processes with genuine goodwill. According to the actual situations of the nation, although areas for regions and states are divided with various names, it is important not to cause secession, breaking off and diversity for the form of the Union as various ethnics are residing in all regions of the nation unitedly. Therefore, the Senior General stressed the need to organize national brethren to carry out public welfare tasks in their assigned areas for enabling the ethnics to have maturity of their Union Spirit with the aim of restoring eternal peace and safeguarding Our Three Main National Causes. 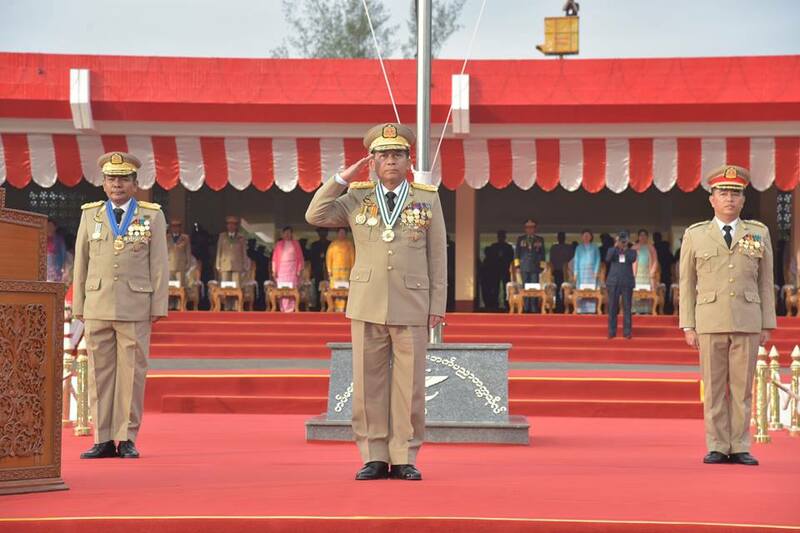 The Senior General noted that always serving the public interest as dutiful endeavours in its history is a fine tradition as well as a specific character of the Tatmadaw. 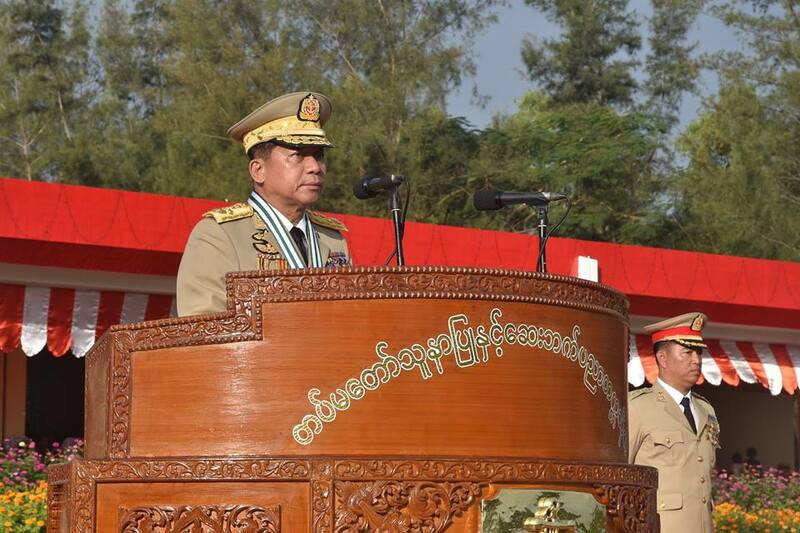 The Senior General urged them to train themselves to become good inheritor Tatmadawmen as well as reliable servicemen on whom the people love by emulating fine traditions of senior Tatmadawmen who have dutifully served the Tatmadaw and the people. 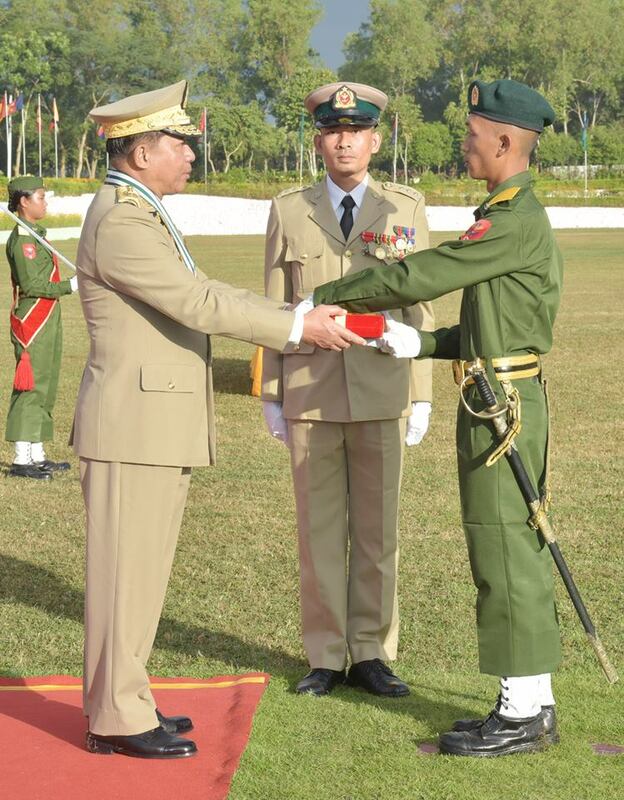 After taking the salute of the trainee companies, Senior General Maha Thray Sithu Min Aung Hlaing left the parade ground. 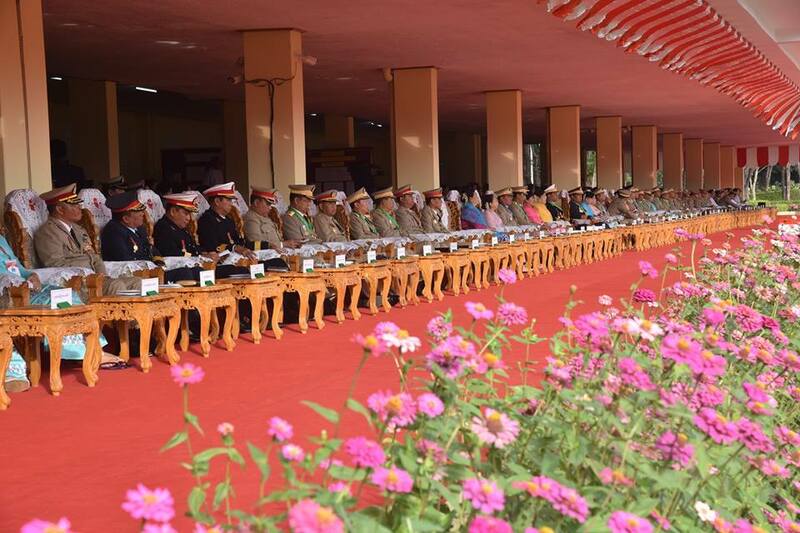 After the parade, the Senior General received outstanding trainees from the 15th Intake of Nursing and Paramedical Sciences and their parents and those of the 2nd Intake of the Lady Nursing Sciences together with their parents at the parlour of the main building of Defence Services Medical Academy and gave words of honour. In his speech, the Senior General noted that parents nurtured those trainees from their childhood to the time when they passed the matriculation examination. It can be said that securing outstanding awards and standing on their own is paying back gratitude to the parents. However, as parents are grateful, the trainees should not forget their gratitude. Nursing and paramedical science must be applied in providing health care services to the people so as to promote good relations with the people based on five basic principles of nursing spirit. Every-body said an ordinary patient will have a half relief from sufferings if one receives sympathetic relations. As such, members of medical services need to uphold sympathy for patients. Promotion of ranks would depend on their efforts. The Senior General urged those outstanding trainees not to reduce utmost efforts as they won the outstanding awards due to their hard working the whole training period. The Senior General stressed the need to control their subordinates under 16 characteristics of leadership in order to abide by disciplines. 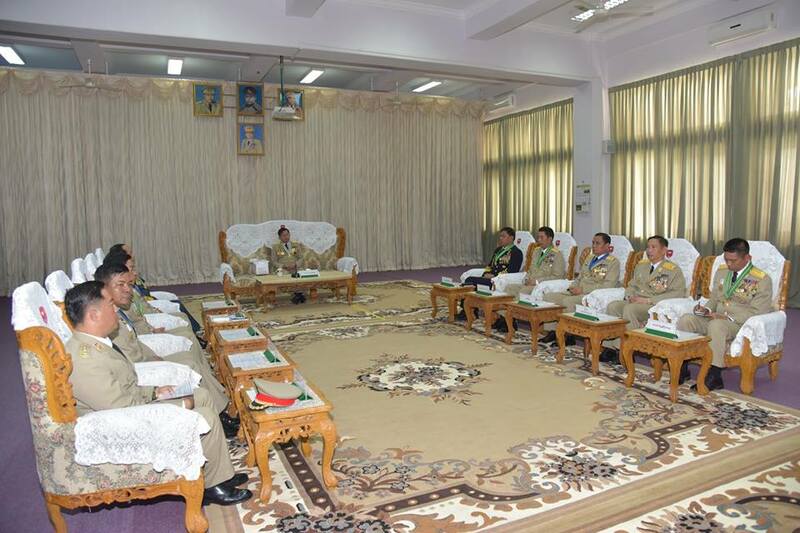 Moreover, he said it is necessary to follow the disciplines issued by the Tatmadaw. Afterwards, the Senior General and party inspected skill demonstration on providing medical treatments to those injured in the military operations at the tactical operations command level battlefield hospital and division level mobile battlefield hospital performed in the main hall of the Defence Services Medical Services. Officials con-ducted them round the demonstration. 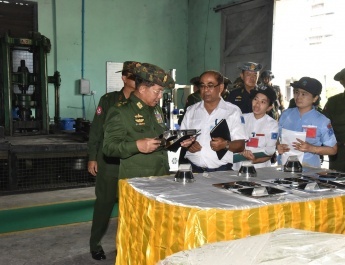 After hearing the reports, the Senior General instructed officials to provide more training aid and equipment and to hold subject-wise skill demonstrations after giving systematic training to the trainees to have efficient skills.